Kriminalpolisenheten is the PUP that uses misleading techniques to prevent removal. Use Reimage to locate malicious components and get rid of them faster than with uninstall instructions. A full system scan blocks virus reappearance and prevents traffic to malicious domains. HOW CAN I GET INFECTED WITH Kriminalpolisenheten virus? HOW TO REMOVE Kriminalpolisenheten virus? Kriminalpolisenheten virus (can also be found as Politiets Sikkerhetstjeneste virus) is a sneaky ransomware, which is spread by trojan horse. Once it gets on its target PC, this trojan modifies some of system's parameters and blocks it down. It should be mentioned that system's block appears every time you reboot your computer, so it's really hard to avoid it. In addition, this trojan is responsible for downloading malicious ransomware's files onto the system. As a result, Kriminalpolisenheten virus gets ability to show its misleading alert that covers entire PC's desktop and reports about various law violations. Those who were infected with this or similar threat know that you can expect reports about illegal downloads, the use of copyrighted content, distribution of spam and similar law violations. Please, don't believe this cyber infection because it seeks only to make pay an invented fine. We highly recommended removing Kriminalpolisenheten virus from the system as soon as it starts showing up there. As we have already mentioned, Kriminalpolisenheten virus is distributed by trojan horse, which is responsible for downloading malicious files, installing ransomware and similar activities. If you want to prevent its infiltration, avoid illegal websites, freeware/shareware and spam. If this virus manages to get inside, it blocks down the system right after that. It hides entire PC's desktop and shows its own warning instead. 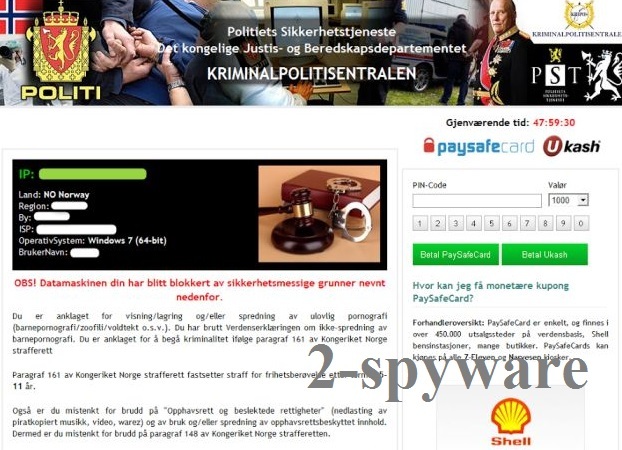 This warning is set to report about various law violations and ask to pay the fine of NOK 1000 for unblocking the system. However, if you pay the fine, you will still find your computer blocked. If you want to save your money and avoid unwanted activities that can be caused by this malicious parasite, we recommend removing Kriminalpolisenheten virus from PC as soon as possible. 1. Take another machine and use it to download Reimage or other reputable anti-malware program, such as Malwarebytes MalwarebytesCombo Cleaner or Plumbytes Anti-MalwareMalwarebytes Malwarebytes. 4. Reboot computer infected with Kriminalpolisenheten virus once more and run a full system scan. This entry was posted on 2013-09-24 at 05:22 and is filed under Ransomware, Viruses. You can quickly scan the QR code with your mobile device and have Kriminalpolisenheten virus manual removal instructions right in your pocket. How did you remove Kriminalpolisenheten virus?